The LG Optimus F3 is a triumph of mediocrity, a symphony of plain, and a stunning achievement in merely existing. Put it up against the other members of the Optimus family of smartphones and you'll find that this Android phone lacks any of the pizzazz that made its predecessors worth noting. Neither some fetishized work of art, nor a dead albatross stuffed in your pocket, the F3 is simply what it was always meant to be: A phone for people who value making phone calls more than fancy features. The F3 is a sturdy little phone, but I thought it felt heavy considering its diminutive size. The phone is actually a bit too small for my hands to feel comfortable, but keep in mind that I also adore LG's Optimus G Pro for it's ability to rest comfortably in my hand. The phone is mostly made up of plastic but the back panel deserves special acclaim: It's composed of the same material as the rest of the phone, but the texture prevents fingerprints and gives the F3 a more premium feel. 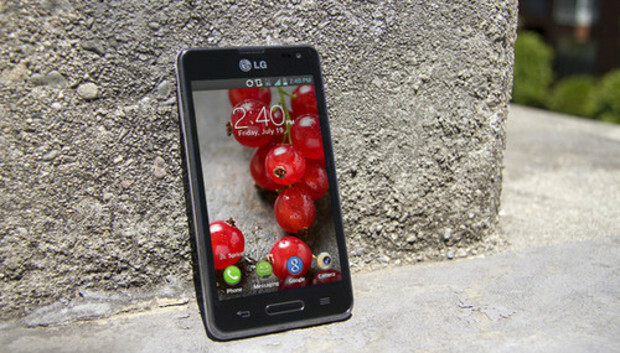 After previously reviewing the LG Optimus G Pro, I was less than dazzled by the low resolution, 4-inch display on the F3. Although the phone's screen size is pretty standard--especially among budget handsets--I wasn't prepared for how fuzzy it would look after a recent spate of better devices. Reading through pages of text is particularly uncomfortable on the F3, the slightly-out-of-focus screen causing eye strain after moderate use. If camera excellence is your first and foremost concern, I suggest you look elsewhere. The 5-megapixel camera on the F3 is okay for the occasional snapshot, but colors tend to look washed out and don't even try using the phone to take pictures in dark environments. If you want a phone that's capable of taking photos you can be proud of, you'll need to spend the extra cash and buy a more premium smartphone. Like the rest of the device, the hardware under the hood isn't anything to write home about. The F3 runs on a 1.2GHz dual-core Snapdragon 400 processor and 1GB of RAM. The Snapdragon 400 processor isn't bad, per se, but keep in mind it means the F3 isn't very future-proofed. A budget phone like the F3 already seems sluggish next to the current heavyweights of the smartphone kingdom, and within months will be even more outgunned. People who use a phone as just a phone won't hit the ceiling for a while, but I already experienced a bit of slowdown in the most graphically intensive games, and things can only get worse. I did like that LG included its QSlide multitasking feature in the F3 (limited as the multitasking is). You can launch five QSlide "apps" from the notifications panel: videos, browser, memo, calendar, and calculator. These apps launch above whatever you have open currently and follow you from screen to screen, allowing you to use the browser while another app is open. It's convenient to have any sort of multitasking, even when limited to these five apps, and I hope more devices follow suit. The F3's removable battery is fantastic. Even with Google Field Trip pinging my GPS all day long, the phone easily lasted until I got home every night--sometimes late at night--with battery to spare. But while I was impressed with the F3's battery life, its internal storage left me wanting. The phone includes little more than a gigabyte of internal storage out of the box which means you'll need to have a microSD card if you want to install apps or carry your music with you. Calls made over Sprint's network were clear, with minimal amounts of static and background noise. In short, you shouldn't run into any problems using the phone as a phone unless you live in an area that isn't covered by Sprint. The F3 is a Sprint exclusive, with all the baggage that entails, and so it's perhaps most galling to see the bold, oversized "4G LTE" branding on the F3 box. Listen, Sprint, it's all well and good to say the F3 is ready for 4G LTE speeds, but first you need to actually build an extensive LTE network. If you're thinking of purchasing the F3, please do your homework and check your coverage first. Here in San Francisco there is one narrow strip of the city with Sprint LTE coverage, and even 4G coverage is far from ubiquitous. In fact I'd say the F3 ended up running on 3G more often than 4G during my review period, which, especially in such a tech-heavy city, is downright cruel. Just make sure you're hooked up to WiFi if you're trying to download apps or browse the web. If you haven't upgraded since the last time the Yankees won the World Series (yes, it was that long ago) and you're looking for a mid-tier phone at a superb price, the F3 might be right for you--sign with Sprint and the device will cost you the low, low price of free. On the other hand, the F3 does little to stand out from its competitors. It's a solid phone, but ultimately forgettable. Not everyone needs the latest and greatest hardware, of course. The F3 is a fine phone for people who just want a phone, as foreign a concept as that might seem these days, and it's good of LG to provide those people a low-priced option. But that doesn't necessarily make the F3 any better than average.